This edition of the GNL features a faux salvation scenario, where salvation hinges on the results of a math test, and the real-life story of an African Saint. Fr. Steven’s Homily completes this lesson with parables we all can relate to. As you read, think about your own spiritual journey, and how you have changed or resisted change. In addition, this issue features a new vocabulary section. Vocabulary words are in italics. When you come across an italicized word that you’re not sure of, look on the back page for a definition. When you write your next letter, see how many new words you can use! Let us know your thoughts and reactions to the topics in this edition of the GNL and if you like the vocabulary section. Imagine if everyone in the world had to take a math test to determine their fate; passing gives a full reprieve, granting salvation, and failing means eternal damnation. This “Ultimate Test” is given to each person individually and is personalized to be age appropriate and take things like talent and circumstances into consideration. There is an extensive and detailed instruction manual available in advance, which lets everyone know what to expect and gives specific instructions on how to prepare. Knowledgeable tutors are available for guidance. Nevertheless, the timing of the test is totally random. When a person is called for their turn to take the Ultimate Test, they do not return, leaving family and friends to wonder whether they passed or failed. So, as you can imagine, being vigilant, No. 2 pencils sharpened, etc., is of utmost importance! Under these conditions, it would stand to reason that Ultimate Math Test would shape the world we live in; it would create a certain excitement and anticipation. Everyone would take a great interest in all things “Test” related. T-Shirts, bumper stickers, lyrics of songs, themes of movies, plots of novels, would allude, in some way, to the Test. Parents would create elaborate learning environments for their children, instilling healthy eating habits for better brain power, memorization and retention skills. Passing the test would be everyone’s education and fitness goal! Faith in the Test would be essential; if people didn’t believe in the Test, they wouldn’t bother to prepare for it! Likewise, if the test were to be too difficult or too easy, things could go awry. Some test takers would feel despair, automatically expecting the test will be too difficult for them. Others would be hopeful but nervous. Still others would be cocky and think “I’ve got this” and fail to study at all. Intellectuals might scoff, finding it beneath their dignity to take the Test, thinking of it as a joke or ruse designed to distract common people from life’s woes. Inevitably, there would be an Anti-Test movement. The fairness of the Ultimate Math Test would come under scrutiny. Talk show hosts would hold panel discussions with “experts” refuting the premise of Test, giving opinions, calling it a myth, describing it as racist and anti-woman. They would decry geek privilege! “If life were fair,” they would muse, “People wouldn’t be forced to go through the anguish and anxiety of a do-or-die test.” Others would argue for alternative test—subjects perhaps a test about sociology or philosophy would be more interesting or inclusive, or one where people could design their own test and grade it themselves! Oh, the money that could be made on alternative test designs: books, CDs, study guides, and Test-themed summer camps and conferences! So-called experts (who know little about the origin or the Designer of the Test) would agree that all alternative tests should-would-could lead to the same happy place. They would make a motion, second it, take a vote and declare that everyone should get an automatic A; A for effort (even without the effort). They would eventually declare the test “dead” and the centering effect that the Ultimate Math Test had in the world would give way to chaos. The Ultimate Math Test is an analogy that compares preparing for a test and working out our salvation. Jesus Christ (God the Son) became man, lived among us, died and rose again to open Heaven’s gates to all of us and restore all of us to our intended state of perfection. Nevertheless, when someone wonders “How can I go from being a sinner to a saint?” They follow a similar thought pattern to a test-taker: “I’m never going to be smart/good enough, so I won’t try.” “I tried but it turned out to be too difficult so I gave up.” “I don’t know what test/faith is the right one, so I’ll just study whatever I can at home.” “I’d rather enjoy life and not worry about what will happen after the Test/death” “I’m young, I’ll study later,” then BOOM, time’s up! Or, ‘This Test/God business is for simpletons and losers, count me out!” So, math-test analogy aside, how does a person really go from lost to saved, from being a sinner to a saint? One of the most well-known stories of total transformation in the Holy Tradition of the Church is that of St. Moses the Ethiopian, commonly known as St. Moses the Black. No mathematician, Moses had to work hard to win his soul back from the evil one. With God’s help he went from being the worst of sinners to the most shining example of sainthood. Some might say he cheated on the test because, as a big strong black man with violent tendencies, Moses took heaven by force! As it turns out, using force was and is a perfectly legitimate way to get in (Matthew 11:12) (Luke 16:16)! Like Algebra, Salvation’s less complicated than it may appear at first, but that doesn’t mean it’s easy! Born in the year 330 AD in Ethiopia, it is possible that Moses had been born into a Christian family; faith in the Risen Lord came to Ethiopia soon after the Resurrection (read about it in Acts 8:26-40). Due to unknown circumstances, possibly the persecution of Christians, Moses became a slave as a boy and was taken to Egypt. He served in the house of the Governor in a land where the people worshiped the Sun. It is not clear if his name was Moses already, or if he was given this name later (when he was baptized). There is speculation that in his master’s house he was simply called “the Black” because his extremely dark skin made him stand out among the other slaves and Egyptians. Moses longed to know God from an early age. While a slave, and later as a bandit as well, he would look up at the sky and call out saying “O Sun! If you are God, let me know”. Then, perhaps to cover any doubts, he would add, “And you O God, whom I do not know, let me know you!”. He was seeking truth! He grew to be of fearsome size and strength and developed a frightening temperament. He drank and stole, and one day, he killed someone—not the last to die by his hand. Now a wanted man, he escaped or was “banished” by his master (depending on the account you read). Alone and a fugitive he joined a gang, soon taking command as the leader. Moses went from bad to worse. He become a legend in his own time; people trembled at the mention of his name. He attacked herds of sheep and carried off rams two at a time. If the poor shepherds resisted his thievery, he’d return and kill the whole flock out of anger, depriving him of his livelihood and maybe even his life! One day something changed— perhaps it was at dinner, at the fire pit after roasting stolen rams, and drinking stolen wine. He repeated his merry rants to the Sun and to God saying, “God, let me know you!” and someone, perhaps a passerby or an angel, answered him and said “The monks of Wadi El-Natroun (a town) know the real God. Go to them and they will tell you.” Moses got up immediately, strapped on his sword and set off for the monastery. Some accounts claim he went to rob the monks of their golden chalices and any donations left by pilgrims. Others say that he went to find Truth and nothing else. Providentially, he came across a priest, Abba Isadore (now known as St. Isadore), who trembled with fear when he saw the massive fugitive blocking his path. Moses begged him not to be afraid, explaining that he wanted to know the true God. Abba Isadore, trusting in God, took Moses to Elder Macarius (now known as Saint Macarius the Great). Although many of the monks were not convinced and feared him, their efforts to run Moses off failed; he refused to leave! The Elder soon understood from Moses’ tears and deep repentance that he was sincere. St. Macarius personally catechized and baptized him. One evening four robbers entered Moses’ cell hoping to find something of value to steal. Not wanting to harm them, he tied them up and carried all four on his broad shoulders to the church where the brothers were praying. He asked the Elder what to do and was told to let them go. But the robbers recognized Moses and marveled at how their old gang leader had changed. They begged to be allowed to stay and become monks too. With time, most of his former band of highwaymen repented and joined the monastic order. Moses once again became their leader and mentor, this time, to the Glory of God. For a long time, Moses lived in an isolated cell in the desert wilderness where he fought against the passions (pride, anger, lust, envy, gluttony, avarice and sloth) and the memories of his evil deeds. It is said that his spiritual fight against his former master, the devil, was greater than that fought by any other saint. He fought his compulsions, the desire to live an extravagant lifestyle, to eat and drink to excess with fasting and prayer. His greatest struggle was against the lusts of the flesh (fornication, etc.). Moses confessed all his sins and struggles to Abba Isadore, who comforted him and taught him how to fight against temptation and the wiles of the enemy. Keeping the all-night vigil, Moses spent long hours standing in prayer every night. Then, while the others rested, he took many trips to the far off well and brought water to fill the water pots of the brethren. One night, while kneeling over the well to draw water, he was attacked by a demon. The invisible attacker dealt him a mighty blow to his back. It was the last act of vengeance against him for changing his allegiance from evil to good. After a year, he recovered from his injuries and was freed from the passions that had plagued him for so long. God granted him power over demons and from then on they feared him. Once, when a monk was caught in a sin, the elders and brethren sent for Moses to come to help determine a just punishment. Moses, who was working at a distance, refused to come. They called for him again and again, finally compelling him to return. Moses came with a basket filled with sand strapped to his back. The basket was leaking, and sand trailed on the ground behind him. His face and furrowed brow reflected his displeasure at being obliged to come. Once in the room, the leaking sand accumulated on the floor behind him. The elder pointed to the pile and asked, “What is the meaning of this?” Moses replied, “Those are my sins, which follow behind me where I cannot see them, and here I am (as ordered), come to judge my brother!” The accusers quietly left the room ashamed (reminiscent of John 8:1-11). News of the monk Moses and his wisdom and power over demons eventually spread far and wide. When pilgrims started to come and seek his counsel, Moses tried to hide from them. The governor of the land came to the monastery in search of him and was told he had gone to his monastic cell in the wilderness. The governor’s men went to find him and, encountering him on the road, they asked if he was or had seen the wise monk Moses. Moses tried to dissuade them from continuing to look, saying, “What do you want him for? He is an ignorant old man, very untruthful and completely impure in life.” However, with time Moses became accustomed to receiving pilgrims and was known for his wisdom, gentleness and hospitality. Abba Moses became the abbot of a small monastery in the Western Desert of Egypt and had 75 disciples. He taught them and wrote rules for monastic life. He was sought out continually for his spiritual guidance and graciously received an endless stream of pilgrims. It is preserved in Holy Tradition that when a monk came to him asking advice, Moses told him to return to the solitude of his cell and that “your cell will teach you everything”. This was a lesson he had learned early on from St. Isadore and passed on to his disciples. Over the years he was the spiritual father to 500 monastics. The elders were gathered one day and St. Macarius the Great had a premonition: “I see among you one to whom belongs the crown of martyrdom.” Moses spoke up and stated that “It is probably for me, for it is written: For all that take the sword, shall perish with the sword” (Matt. 26:52). This prophesy would come true. One day, Abba Moses was granted foreknowledge that barbarians would soon attack the monastery and kill everyone they found. He blessed those under his care to leave and avoid the violence that was coming. The brethren begged him to leave with them to which he answered, “For many years already I have awaited the time when the words of my Master, the Lord Jesus Christ, should be fulfilled.” Despite his pleadings, 7 brothers remained with him. One, providentially, hid and became a witness to their martyrdom, preserving these details of the Saint’s life for us. He saw angels place crowns on the heads of the martyrs (look up Revelation 2:10)! The glorious Abba Moses and his companions were victors and conquers in their quest for salvation. He was 75 when he entered the Kingdom of God in 405 AD. The historical account of the Life of Saint Moses was kept and retold by monks who knew him, some of whom knew him while he was still a great sinner and had witnessed the change in him. His life’s story was written down about 70 years after he died, probably in conjunction with his canonization. He was declared a saint due to the many miracles attributed to him both during and after his earthly life. His relics (his body and any of his belongings) are preserved in a Coptic Monastery of El-Baramouse, Egypt to this day. Saint Moses is alive in Christ and is your friend and companion. He stands before the throne of God! Ask him to intercede with Christ on your behalf, and HE WILL! Abba Moses intercede with Christ God on my behalf and on behalf of all the men and women in prison who seek to know God and to change from sinners into saints! Everyone, please join together in prayer for the Christians in Egypt, Ethiopia, and our brothers and sisters who are persecuted for Christ all over Africa, the Middle East and the World! Last Sunday we talked about the Gospel reading for that day wherein our Savior said the greatest law was that we love the Lord our God with all our strength, heart, mind and soul; basically, with everything (Mark 12:29-31). We spoke also about the scripture where our Savior said narrow is the path to life and few there be that find it (Matthew 7:13-14). Obviously, we can see that it takes 100% dedication to God find life. Let’s say we are dedicated to God as much as our strength allows and we are in the narrow path to life. What does that look like? Today’s Gospel reading gives us a perfect picture to answer that question. We see the parable of the Master who travels away to a far country and leaves his servants each with a certain amount of silver talents to invest, according to their abilities (Matthew 25:14–30). It’s obvious the Master is Christ and the far away journey represents the time we have as His servants before our life is over and we make account for the investment He has given us. But remember, before the Lord tells the parable, he says that He will return at a time that is unknown to us. So, we have some presuppositions here. Mainly, that the Lord is dealing only with His servants. These are the ones, we can say, that have accepted baptism, have become members of His Body and have been given the gift of the Holy Spirit: They are attempting the narrow path. St. Theophylact says the amount of silver given to each individual represents spiritual gifts, some greater, some lesser, each one according to his own strength, that is, according to the measure of his faith and purity. We see one servant getting five talents, another two and another just one. We see that the Master, our Saviour, recognizes that not all His servants have the same abilities. Yet we see that He expects us all to make an increase of His investment. Yet, notice how He gives the same reward to each servant, whether he increases two talents or five. He says to each: “Well done My good and faithful servant. You have been faithful over a few things, I will make you ruler over many things. Enter into the Joy of your Lord.” This same idea is present in the parable of the workers in the fields, where the Master pays the same reward to those He hires at the eleventh hour just the same as those who have been working since the first hour. However, look at the servant who takes his one talent and hides it, fearing his Master. He is called the wicked servant and his reward is being sent into outer darkness. As you may recall this outer darkness is mentioned in another parable we’ve recently heard. We remember that the man who came to the wedding feast without the wedding garment was cast into outer darkness as well. Keeping in mind that the time when the Master returns from His long trip is the time when we must give account for our life, we see that our efforts here on earth are meaningful for our Salvation. I want to examine this fact a bit more. We know that our Salvation isn’t based on works, yet at the same time our faith without works is dead (James 2:14-26). I believe our last few Sunday sermons gives us a good foundation to understand what seems to be a paradox. How can we make sense of this? Here’s how I will explain it: Everyone is invited now to the Wedding Feast (Luke 14:15-24), everyone has the open invitation to become a servant. Everyone is invited to walk the narrow path to life. Everyone is called to be baptized into the Church! You can’t earn this. It’s a gift available to every person. However, what will we do with this free gift? We receive the Holy Spirit, we receive the wedding garment, we receive the silver talent according to our abilities and we are expected to bear Fruit. And we know that any branch that does not bear fruit is cut off and cast into the fire (John 15:1-7) (Matthew 7:19). In this way, we understand that we don’t earn the opportunity for Salvation—all are called to the Wedding Feast. We don’t earn the opportunity to become servants of the Lord—that is available to “who so ever will.” It’s one thing to accept the invitation, to accept the silver talent—or in some cases—talents. Yet it’s another thing to put on the Wedding Garment, to invest our spiritual currency. And don’t we see how kind our Master is? He doesn’t expect a person with only two talents to perform as one who is given five! Our Master simply doesn’t want to see His Holy Spirit squandered! He calls everyone and treats those who toiled from the first hour the same as those who came at the 11th hour (Matthew 20:1-16)! analogy: a comparison between two things, for the purpose of explanation or clarification. cocky: smug arrogant, conceited, like a rooster! reprieve: pardon, acquittal, cancellation or postponement of a punishment. Written by MJ Dukas unless otherwise indicated. 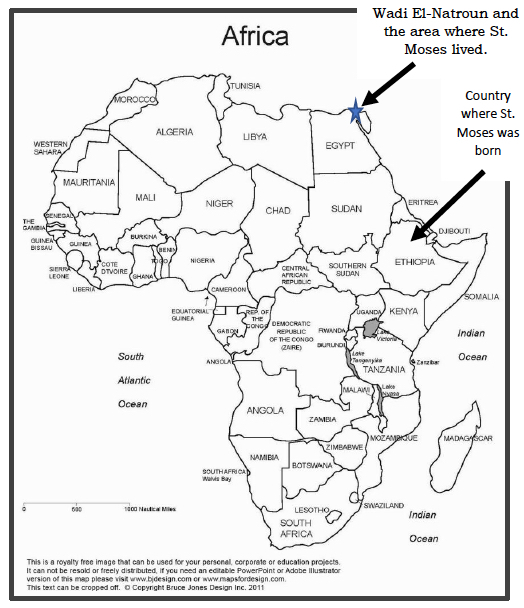 Sources: https://en.wikipedia.org/wiki/Moses_the_Black, https://mosestheblack.org/resources/life/, http://www.orthodoxchristianity.net/forum/index.php?topic=9391.0, https://www.orthodoxroad.com/saint-moses-the-black/. Scene from the life of Saint Moses by Evalyn, age 9 (almost 10), drawn especially for this GNL, September, 2018. The Good News Letter (GNL) is a labor of love of Saint Nicholas Orthodox Church in Fletcher, NC. We send these letters to 50+ people in prisons across NC and the USA free of charge, raising funds for postage and printing. As of February 2018, we have baptized 7 souls through this prison ministry! Contact us at [email protected] or visit our parish website at https://www.stnicholasoc.org/. Donations of books, time, and financial support are always welcome. Want to help or start a prison ministry at your parish? 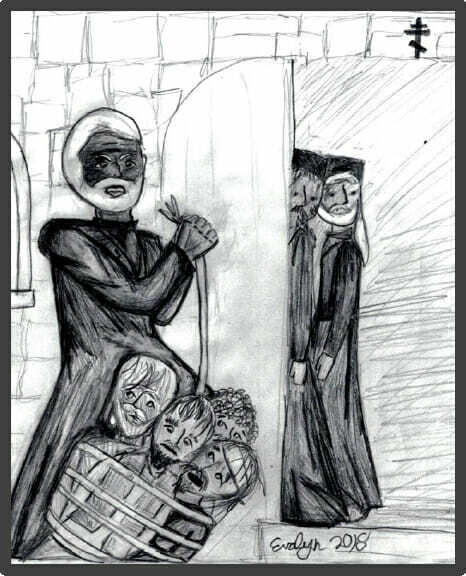 Write us at: St. Dismas Prison Ministry, PO Box 19616, Asheville, NC 28815.